Farmers are increasingly under pressure to feed more people. The UN predicts that the world population will rise from 7.3 billion today to 9.7 billion in 2050. This growing population has become pickier about the food they eat. In the EU alone, the organic market grew by 7.4% in 2014 with sales valued at €24 billion. Beyond organic food, there is an overall push to make farming greener by using less water and pesticides. “Agriculture is most vulnerable to the impacts of climate change, but it’s also one of its causes”, says Birgit Schulz from Deepfield Robotics. “Making cultivation sustainable is essential”. These factors mean farmers need to produce more, at a higher quality, and in a sustainable manner. With youth turning away from the profession, there is also less labour available to drive the vision forward. Enter the robots — set to improve production yield, while reducing resources required, and making farming an exciting high-tech profession. “Few people want to get up at 5am, farming is a heavy and dirty job.”, says Eldert van Henten, head of the the Farm Technology Group at Wageningen University in the Netherlands. He adds that, “the high-tech nature of future farming might attract new people into the profession, but also bring back those who left”. Robots are just part of an overall push towards precision agriculture. Given the potential, Europe has funded at least 6 projects around robotic farming. And there is plenty to do given the large number of tasks on a farm that are ripe for automation. For crop farming, robots need to autonomously navigate their environment and perform actions at set locations, for example, picking a fruit, spraying a pesticide, planting a seed, imaging a plant, or making a measurement. Glasshouses are slightly simpler to move around since the environment is more carefully engineered, and is often fit with tracks which robots follow to reach desired locations. In the case of outdoor farming, the robots work by receiving a plan with a set of locations to visit on the field. When the robot trajectories are known, the robot can use GPS positioning and a closed-loop control to make sure it remains on track. When the task is to follow an unknown trajectory, for example a crop row, vision is often used to allow the robot to find its way. Robots are wirelessly connected to a central operator to both receive updated instructions regarding the mission, and report status and data. Put together, making an autonomous farm robot requires clever controllers, localisation and communication systems. To a certain extent, the technology is similar to that of autonomous cars applied to agtech. Where it differs is that farming robots often need to manipulate their environment, picking vegetables or fruits, applying pesticides in a localised manner, or planting seeds. All these tasks require sensing, manipulation, and processing of their own. When it comes to using robots with intelligent tools, the achievements are promising. Bosch startup ‘Deepfield Robotics’ also develops technologies for sustainable farming. “Our products are sensor networks and robots”, says Birgit Schulz. Their robots navigate plant rows, sense the plants, and send the data to the farmers to help optimise seed breeding. If equipped with a “weed puncher”, the robot can literally drive weeds into the ground. Deepfield Robotics also provides smart sensors that can be positioned in the fields. Resulting networks are already deployed in farms to monitor soil conditions for asparagus. There are however many challenges ahead. Pablo Gonzalez de Santos says “Technical developments are required to identify fruits and analyse their degree of ripeness in harsh conditions (changing light conditions, presence of dust, extreme temperatures, wind variations), as well as to detect weeds. Robot position accuracy also has to be enhanced to help optimise pesticide applications and the precision of manipulation. 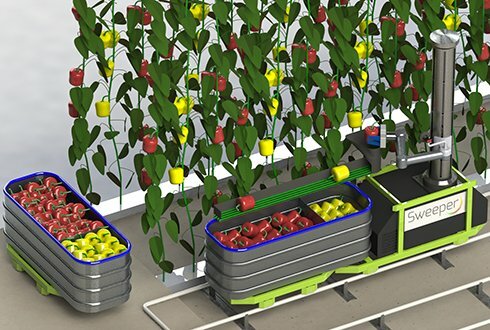 Although industrial manipulators exhibit very good accuracy and speed in factories, their application in farming is more difficult due to the objects moving, being soft and delicate, and obstacle-rich environments.” Just imagine what it takes to pick a sweet pepper from a plant, compared to grabbing a bolt on an assembly line. As it turns out, sweet pepper harvesting is the subject of the recent Horizon2020 Sweeper project, which follows a previous EU project called Crops. And as is often the case in robotics, the lack of clear regulation is causing a headache for companies entering the field. The good news is that farms are already open to new technologies being deployed and the investments that are required. You just need to look at some of their equipment to see the high-tech machinery in place. A little known fact: farms are already amongst the most prominent adopters of robotic technology. Lely, which is based in the Netherlands, has a fleet of over 20,000 milking robots installed throughout the world. The Lely Astronaut A4 box allows cows to be milked when they choose so, instead of when the farmer needs it to be done. The robot attaches incoming cows to the teat cups, reattaches them if required, and detaches them after milking. As an added bonus, data about the cows is collected, which can help the farmer monitor the herd and take action should a problem arrive, or simply to improve yield. The company also makes autonomous mobile robots that clean the barn, and automatically feed the cows with Juno and Vector. And the farm of tomorrow will include many robots working together. 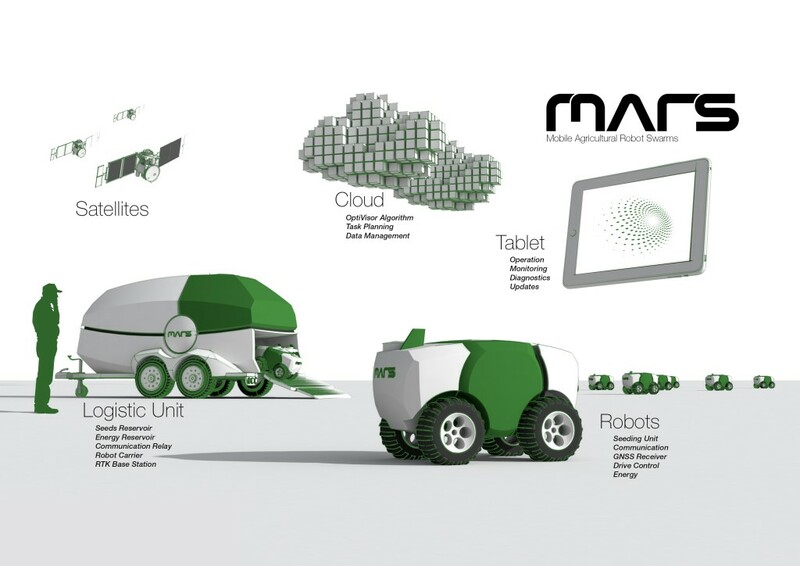 The MARS project, which stands for Mobile Agricultural Robot Swarms, demonstrated a cloud-based approach to farming at Hannover Messe last week. By deploying many simpler and smaller robots, they hope to make their farm-solutions safer, more reliable, and productive, while avoiding soil compaction that comes with larger robots navigating the fields. A swarm could also provide continuous operation, by having robots take turns charging or undergoing maintenance. It’s an all around exciting time to deploy robots on farms, and there is a clear need to do so given the drive for increased food production, and sustainability. Steps are currently being made to develop the technology that will enable the automation of individual tasks before integration in a “digital farm” that will empower farmers to run operations in a fulfilling and efficient way. But there is still a lot of work to do. Eldert van Henten says robots will need to be “quick, precise, 100% successful, and cost-effective” before we can hope to see them on our farms. But, he adds, there is a “trend towards human-robot co-working. With one or more robots doing (part of) the job while being supervised, instructed by a human, or jointly working with a human. This might improve acceptance and feasibility of robotics technology for the more challenging tasks in agriculture”.